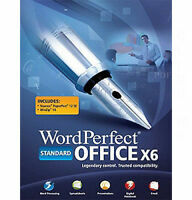 COREL WORDPERFECT OFFICE X6 STANDARD INCL QUATTRO PRO X6,PRESENTATIONS X6, More. COREL WORDPERFECT OFFICE X5 STANDARD INCL QUATTRO PRO X5,PRESENTATIONS X5, More. Country/Region of Manufacture: Unknown Format: Floppy 5.25"